Armed civilian saves the day as Palestinian taxi driver runs over Israeli pedestrian, then emerges from vehicle and tries to stab others. At least one Israeli has been lightly wounded in a car-ramming attack at Kfar Adumim Junction, northeast of Jerusalem. The terrorist was shot dead by an armed civilian before he was able to stab anyone. 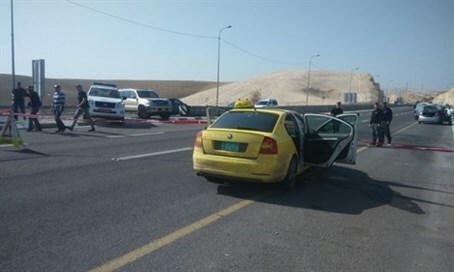 "A Palestinian man at Kfar Adumim junction in a Palestinian taxi tried to run over civilians. When he failed he exited the car with a knife and attempted to stab. The terrorist was shot by a civilian and died of his wounds," a police statement said. Reports from the scene indicate that the terrorist was a Palestinian taxi driver, who struck the victim with his taxi while attempted to run over other Jewish pedestrians. The driver then emerged from his car brandishing a knife and attempted to stab other civilians, but was shot dead. The wounded victim was at the scene by Magen David Adom paramedics, before being evacuated for further treatment at Jerusalem's Mount Scopus hospital. The attack came just minutes after similar attack at a junction several miles north in Samaria. In that incident, an Arab woman attempted to stab Jewish civilians, but was run over by an alert Israeli driver, after which Border Police shot and seriously injured her.